Chad knows a guy who knows a guy who I sort of know who knows a guy who sold me a Pop'n for $1500. I need to transport this mofo from Louisville to Indianapolis however I really, really don't think that a UHaul or STI shipment is necessary. 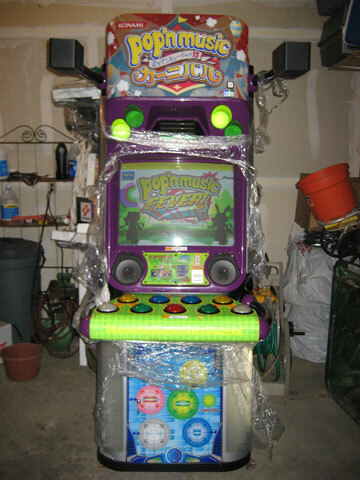 For the guys who have moved a Pop'n around, how feasible is it to move a Pop'n cabinet in a truck or minivan? Does anyone where have a truck and/or minivan that would like to hang out with Chad and I for an all-expenses paid weekend moving a Pop'n cabinet from Louisville to Indy? Should I just go the Uhaul route or is that a waste of precious dollars? Re: Welp, bought a cabinet! I did a Google Image search for that style of cabinet and Ho's LJ turned up. A minivan is probably pushing it. Check EVERY dimension. A cargo van would probably work while still getting decent fuel economy and not costing an arm and a leg, but still check dimensions. Right now the plan is to bring the Pop'n cabinet to Arcade Expo in Louisville in March or whenever it is and to then take the machine from there to Chad's house in Indy. I still don't know exactly how I'm going to get it there but I guess a cargo van will work assuming I can find one in Louisville. Do I need to transport this thing upright or can I lay it down on its back? You can lay it on its back, but it's worth opening it up to make sure everything is secured, especially the monitor, before doing so (close it back up for transport). If it's running on hardware that uses optical discs, you might want to eject them and store them in a safe place during transport. Bring plenty of moving blankets to avoid (mostly cosmetic) damage. I'll be happy to loan a bunch to you if you need them. Merk, what version of Pop'N are you running on that badboy currently? I'm coming out of retirement (bought a new ASC) and I'm woefully out of date on what is going on with the series. Welp, I ended up not buying it after all but looking through old e-mails it looks like it was a Pop'n 13 back in August of 2013. I'm not sure if Bryan Benjamin has updated it since! I think he brought it to Louisville Arcade Expo last year but I ended up not going because Chad wasn't going because of his whole Denver thing. Oh, okay. Didn't know that.